Sometimes interesting things come in pairs. Our birding experience this late summer has been just that. Not only did we have a pair of Brown Thrashers in our yard but we have been visited by a Sharp Shinned Hawk several times. Now we have had Sharp Shinned Hawks in our yard before but I was not taking pictures back then and as a result I missed some great shots. Several years ago a Sharp Shinned had killed a Pine Siskin just outside our window and proceeded to eat it on the ground under our chokecherry trees. Before it started to eat, it spread its wings out sideways dropping the tips making a kind of tent to cover its freshly killed prey. This practice of covering the prey is called "mantling" and, for reasons unknown, most hawks do it. I wish I had taken that photo. The Sharp Shinned Hawk, referred to as a "Sharpie" by birders, is one of three members of a family of hawks called Accipiters or bird hawks because their main prey is birds. The largest Accipiter is the chicken sized Goshawk (Goose hawk) that can take prey the size of partridges. It can be seen around here only in the winter time as it is a bird of the far north. 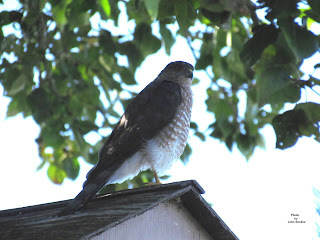 The "middle child" of the group is the crow sized Coopers Hawk which used to be notorious for raiding chicken coops and stealing young chicks thereby earning the nickname of Chicken Hawk. The smallest member is the jay or flicker sized Sharp Shinned or Sharpie. All three are accomplished hunters of birds which they chase down by direct flight. They have rather stubby paddle shaped wings and long tails which give them great speed and manoeuvrability when chasing birds through trees and shrubs. The Sharpie and Coopers are almost identical in appearance with blue grey top sides and white breasts and bellies barred with orange. Because female hawks are larger than males, a male Coopers and female Sharpie are just about the same size and are very difficult to tell apart. The differences are so subtle that one has to refer to a good bird book and then try and get some practice in the field. For those who live in urban areas and see a small hawk chasing birds assume it is a Sharpie because Coopers tend to live more removed from man. This week's photo of a sharpie was taken several weeks ago when my wife scared it up from her flower bed. From there it flew up and sat on our Purple Martin birdhouse where I got this shot. We do not know what it was doing in the flower bed as there were no signs of it feeding. As a final note one has to remember that if one puts out feeders for birds it also attracts predators like shrikes and hawks. 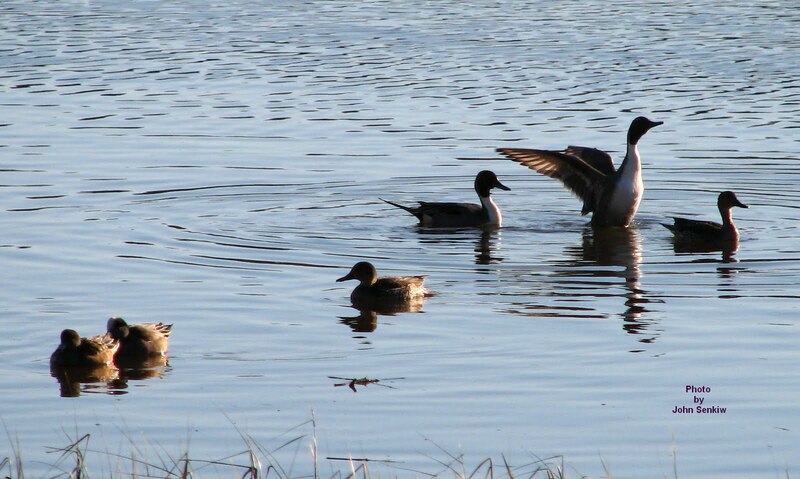 It may be heart wrenching to watch a predator take a small bird but that is the way nature is and should be left alone.